This evening was a good evening for a porch chat, once I sprayed myself with some mosquito repellant (all herbal) and walked around the garden for a bit, tending to one thing and then another in a more or less random, mindless manner. I call it Slow GADS, when you wander around doing not much of anything but still doing a few things, like deadheading daylilies, suckering and tying up tomatoes, watering containers that are up on the porch and didn't get three inches of rain dumped on them last night, and taking a few pictures. This tiny tomato already promises to be something special, almost freakish. It's the variety 'Reisetomate'. It looks like it will be perfect for some kind of tomato growing contest this summer. This is what a Japanese beetle looks like right before it dies. It was found quilty of causing all that leaf damage and so was sentenced to death. Death by squishing. Don't ask. But yes, they have returned to torment us gardeners, right on schedule. This zinnia bud looks like it should pop open any time now. Any guesses as to the color it will be? I assure you it will not be red, orange, or yellow. That leaves purple, lilac, white, green, and pink. Is it my imagination or do these two little round 'One Ball' squash look like they are wearing pointy hats and talking to one another? "Who do you think she'll pick first?" "Do you think she'll pick us in time or let us get oversized first?". "I hope I end up in a zucchini pie." "Not me, I want to be sliced up and sauted a bit." 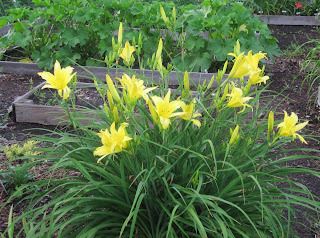 Finally, 'Hyperion' daylilies are blooming at the entrance to the vegetable garden. 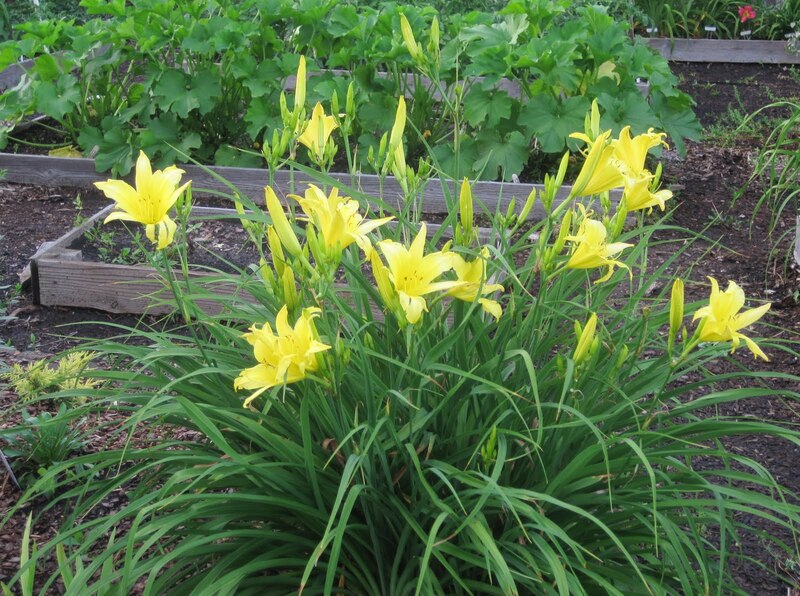 According to the American Hemerocallis Society, this variety was introduced in 1924. I can imagine it growing in my grandmother's garden. After all these years, it is still a lovely daylily and somehow managed not to cheapen itself like 'Stella D'Oro' did. Plus it smells nice, too. And that's five pictures from my garden. Thanks for stopping by for a porch chat! The squash hats are not your imagination...I had that thought just before I read what you wrote! Slow GADS is another great term...less intense than regular old GADS! 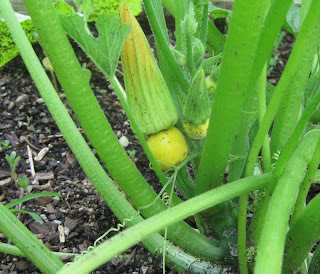 Talking squash. Bless your heart. In my garden, the beans also say Pick Me! Pick ME! I have seen more bugs/beetles/slugs/worms eating the gardens this year than ever before. Your zinnia will be pink. Talking veggies. hmmmmmm I will be on the lookout to see if the peas are chatting about how hot it is or if they will be left to go to seed or eaten. I also vote for pink zinnia. Thanks for the quick tour - you may have solved a mystery for me as I've been trying to name my yellow daylilies. I think it may be "hyperion". 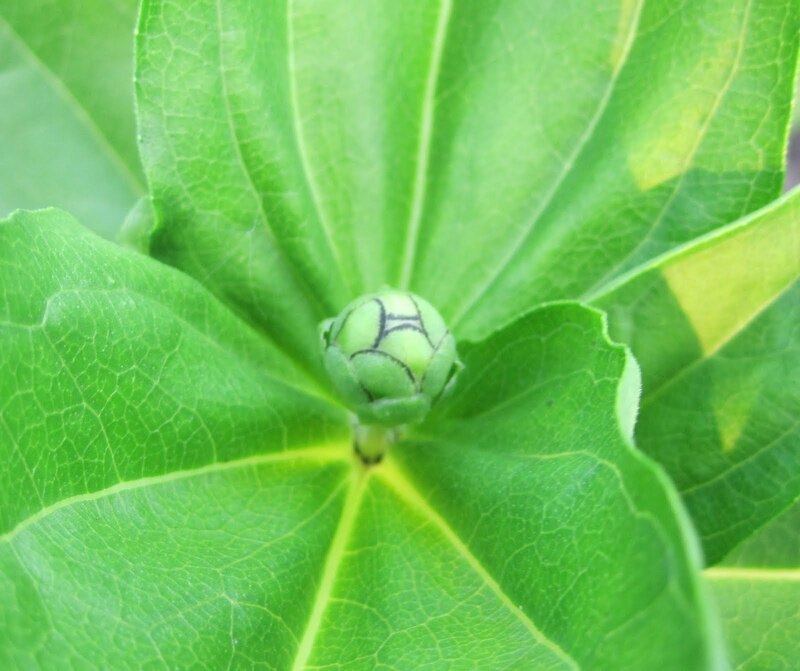 How big is the bloom? It doesn't rebloom like "stella", does it? And finally - what's a GAD? Some bad little bug is eating the heck out of my Zinnia leaves, There are so many little wholes in them that look like Swiss cheese. Lisa and Darla are probably right about the Pink" I'm going to say' Orange..just because I like orange colored Zinnia's. Can't wait to see how that odd little tomato turns out. Make me laugh..eeew, squishing Japanese beetles...I've seen one on a hibiscus flower (White Chiffon). I felt guilty overhearing the squash confab, though. Me, I'm after leaf-footed bugs! A swing and a miss -- then squish! the squash chats are adorable. And that Japanese beetle had to go! 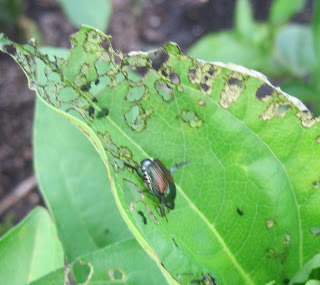 I've got some kind of bug in my garden eating bean plants and my amaranth - but I don't know what. Obviously, nothing as big a a beetle. Ha ha squish, squish! I love that tomato...wonder what it's going to look like!! I loved this! What a great sense of humor you have, Carol. I just saw some JBs yesterday on the rosa rugosas. Hateful things. Since I have to grasp at straws to be happy with my climate right now, I guess I can be grateful that we don't have Japanese beetles! 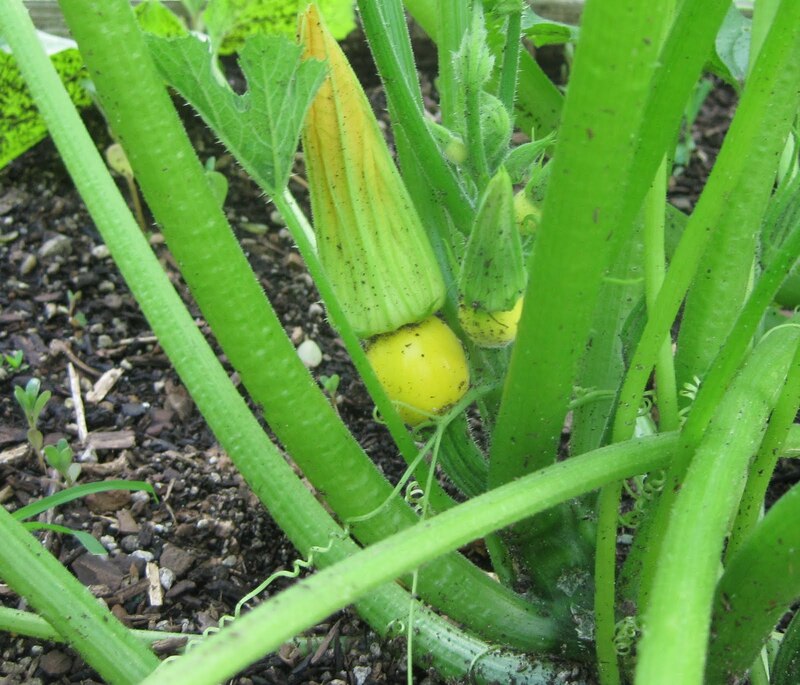 Hi Carol, I found your blog while searching for other fellow vegetables gardeners in Indiana. I had some japanese beatle damage to my basil last week and am scared that they are going to eat everything up. Are they pretty common in Indiana every year? 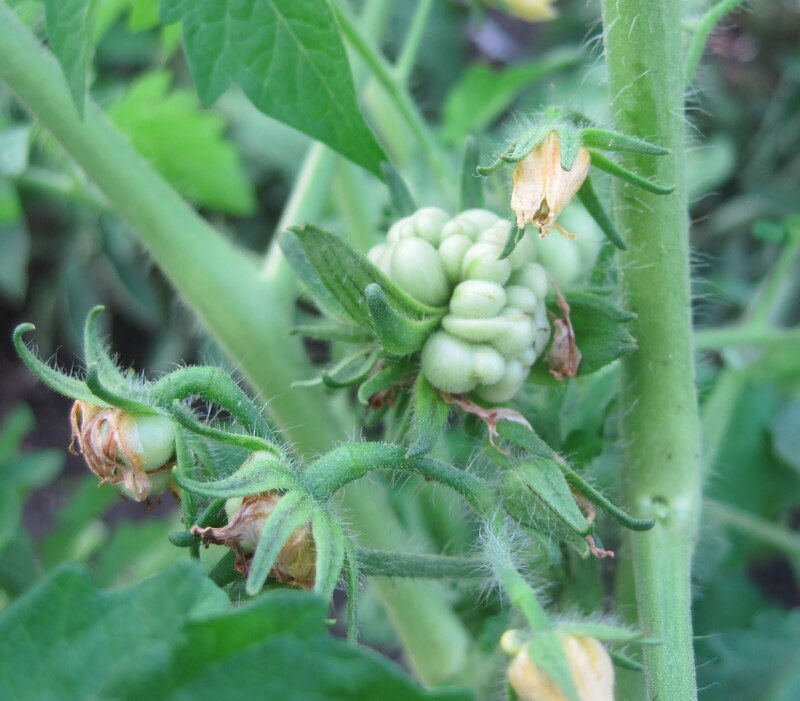 I'm pretty new to Indiana, gardening, and even blogging. I love your porch chat! Would you share what type of herbal insect repellent you put on before wandering around your garden? The mosquitoes love me so much and I have to cover up from head to toe (then my hands are bitten) or use some sort of repellent. My favorite herbal remedy was discontinued and I'm looking for a new one.